JOHN MANN PLAYS THE MIGHTY COMPTON THEATRE ORGAN. What a pleasure it was to be able to join a large (one of the largest I have Seen) and enthousiastic audience to wish John a happy birthday at Brighton's famous Dome Theatre on June 21st. John was on great form as usual and presented a full comedy and music show and, as ever, could do no wrong as far as his audience was concerned. From his parody of 'My Favourite Things' to his hilarious Mr.Pastry by way of Hermione Gingold and Maurice Chevalier he proved that he is the complete one-man show and must have been exhausted by the end of it. His piano solos were a delight and many sang along quite spontaneously. The Dome organ on the other hand still seems not to be quite right and it appeared to be a bit of a struggle for John, however, being the true professional that he is, he carried on and there were a couple of occasions when it sounded really quite nice. John's choice of music ranged from the classical to the relatively modern and proves that people will appreciate a good tune, whatever its age, if presented in an entertaining fashion. Ryhope Community Centre Black Road, Sunderland, SR2 0RX. Admission £4.00 at the door. Doors open 2:00pm for 2:30 start. Tea/Coffee will be served in the interval. 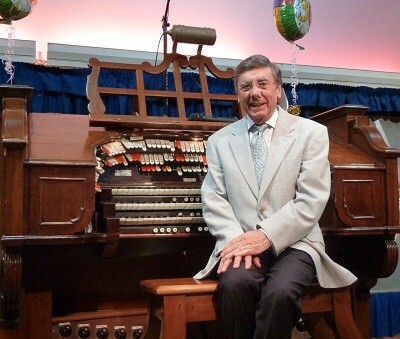 This Concert is a Sunderland Theatre Organ Preservation Society Presentation.